Let’s face it: You will need to use a SEO plugin to write quality, professional content search engines will love. At first, it may be daunting to use a SEO plugin like Yoast, especially if you have little or no experience with SEO. And you may want to pull your hair out as you try to get as many green bubbles as possible. You might think your content is awesome as it is, but you will have to make revisions to make the text more readable and searchable. As you familiarize yourself with the features of this plugin, you can quickly learn about the basics of producing quality, click-worthy content. In fact, it will become second-nature. However, there are a few things your SEO plugin cannot teach you. 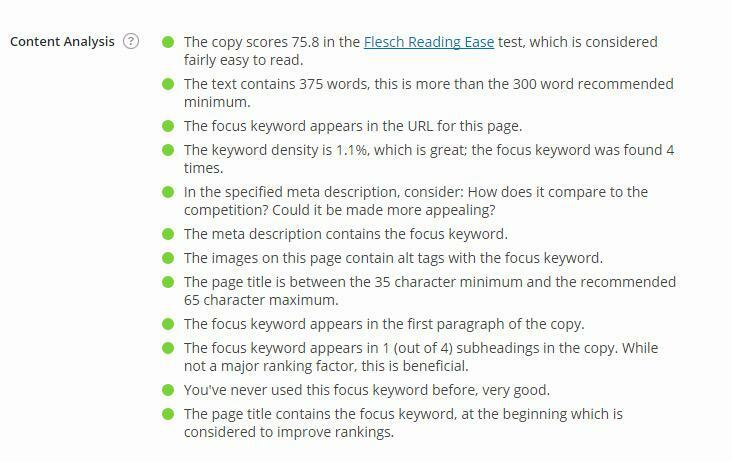 For example, a plugin like Yoast SEO (formally called WordPress SEO by Yoast), may have settings for readability. But it does not account for human behaviors and the overall interest in your content. First, let’s take a quick look at some of the basics of your SEO plugin. Yoast offers common features that allow you to easily use the program and optimize your post, in five key areas. Then, we will look at the blind spots of the SEO plugin. Once you get a better understanding of the human element, you’ll be on your way to making your posts readable, authoritative, and searchable. What Can You Learn from Using the Yoast SEO Plugin? Yoast provides analysis to help those who are new to SEO. In the following areas, Yoast either offers links and tips directly in the respective fields or offers an explanation for the field in the analysis of the page. Note: Yoasts uses a “stoplight” system. Green means “go,” but for Yoast it represents good SEO. Red means “stop” and for Yoast it means a bad SEO score for a particular aspect of the content or webpage. In addition, there is a gray bubble which represents a non-factor for SEO. It also provides a warning to proceed with caution. 1. You Can Learn How a Focus Keyword Should Be Used. The first paragraph of the content. The “alt” text for your image. These are all important for search engines because these factors help the search engines index websites and bring in more traffic. You can even gain more visitors by image searches, so using your focus keyword for the alt text is vital. A meta description is not a ranking factor, but it will likely be used by Google in search results. The text under the green text (which contains the URL) is the meta description. Part of making a relevant meta description is knowing what to put in it — and how long it should be. Yoast SEO makes sure you put your focus keyword in the snippet. And it makes sure the snippet is of proper length. As you type, you will discover that most meta descriptions should be around 135-160 total characters. A bar will indicate if you have too little or too much text to this effect. Yoast also indicates that you will need to make a compelling meta description to set your post apart from others. You description needs to: tell readers what the post is about, be unique, and have a call to action. It takes practice, but these guidelines challenge you to make dynamic descriptions. Yoast SEO generates your URL based on your title. As you’ll find out, you can be within the target range for title length, but go over the suggested character limit for URL’s. That’s because you have to factor in the name of the website, as well. Occasionally, you will get a warning that reads, “Your slug is a little long; please consider revising it.” That’s because your title and URL need to fit within a 512-pixel space. If your URL is too long, it will be truncated by Google. In that case, you have to consider which words you can leave out to still give a preview of what your post is about, if that is possible. Oh, and don’t forget to leave in your focus keyword. Content marketing can be an intensive process. Not only does it involve a great deal of planning, but it also requires you do qualitative research. You have to know what search engines rank highly and how to make interesting content readers can follow. Where does Yoast SEO come in? When your SEO plugin warns you about the number of longer sentences you use, take note. Run-on sentences are usually frowned upon. Shorter sentences help readers move through the text more easily. The same is true for shorter paragraphs. Additionally, Yoast promotes the use of subheadings to break up your content into sections. Specifically, make sure your sections have no more than 300 words. The most important fact is by far the Flesch Readability Score, with zero being the hardest to read and 100 being the easiest. As you can see, there is a link to a page that provides more information, but here’s a rule of thumb: Make your text easier to read for a larger audience. As you work with this plugin to raise your readability score, you will also learn what you need to do to make your text easier to follow. It will eventually affect the way you write. You will likely need to make fewer revisions over time. 5. You Come to Know What Stop Words Are and If They Should Be Used. When you indicate the title of your post in WordPress, Yoast SEO automatically generates a matching URL. However, it may leave out stop words and change your slug if it contains stop words. When you put in stop words (like a, the, about, all), you will likely get a warning about it, usually indicated by a gray bubble. Originally, stop words in keywords were not processed well by Google. Now, SERPs are more geared toward human behavior. Humans are more likely to type in specific phrases, even if they contain stop words. While Yoast generally still frowns upon the use of stop words, you have to consider if the focus keyword you’ve chosen is worth using. Are people likely searching with that keyword phrase? Now, What Are Some Things Your SEO Plugin Can’t Teach You? Yoast SEO is the most popular SEO plugin for a reason. It’s the most complete content-analysis plugin, but it has a few blind spots. 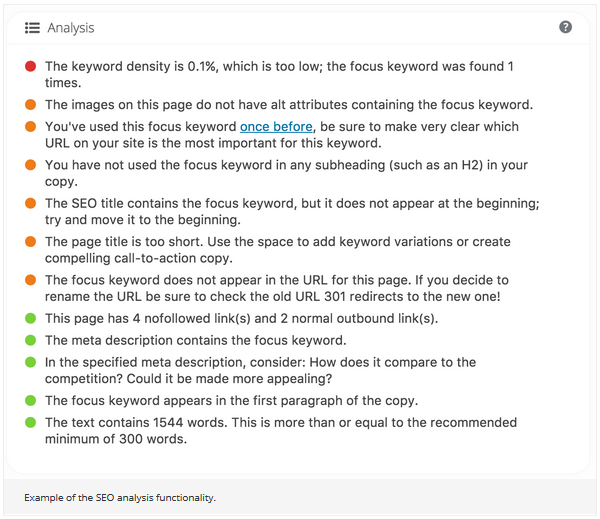 While your Yoast SEO plugin might tell you about the percentage of times you have used your keywords (by a metric that measures one use per every 100 words), you might not need to use the exact keyword as many times as suggested. Now, Yoast will likely update its metric sometime in the futures, but this is still a blind spot. As Google updates its own algorithms, it factors in alternative keywords. This is what you see when you search for something on Google and see suggested searches near the bottom of the page. It’s good not to stuff keywords into your text, so the use of alternates (i.e., synonyms) will help you tremendously. You might even make up the difference by the use of these in addition to the judicious use of exact focus keyword terms. You need to write naturally and in a conversational tone. That means you should use your focus keywords in a similar way. While meta keywords have long ceased to be used as ranking factors for Google, they may still be factors for smaller search engines. If you are new to SEO, the meta keywords field is a mystery. Well, they’re both important, depending on the search engine. You will need to fill out the default keyword field for WordPress users where they can find your tags and reach your blog. But keep in mind it is suggested that you keep the number of tags you use to 10-15 or less. Similarly, that is how you should use meta tags. As Ann Smarty suggests, you should keep your meta tags to 10 total, making sure to organize them by length. Make sure your focus keyword is there, along with relevant themes in your post. Yoast SEO loves the use of outbound (and inbound links). It counts how many you use and ranks you highly for including at least one. But this is still a blind spot. As many SEO experts will tell you, backlinks are considered “votes of legitimacy” and confidence. In that respect, it makes sense for you to link to highly authoritative content. Spammy links and links to questionable websites will only hurt your search engine ranking, so be careful. As you can see, your SEO plugin will teach you quite a bit about writing searchable, readable content, even with your first use. Of course, there are more aspects to content marketing, but these are the basics. Work on improving in these areas and you’ll see your abilities (and audience) grow as a result. The post 5 Things You Can Learn From Your Yoast SEO Plugin appeared first on SiteProNews.